Deco Diamonds is a 5 reel, 9 payline slot game with a 96.03% RTP. This UK Online Slot was released in January 2018 and comes with Bonus Wheel, Substitution Symbols, Free Spins and Respins. A classic looking UK online slot game that features 5 reels and 9 paylines and let you win big with its features such as sticky reels and re-spins. Just for the Win Software in collaboration with the industry giant Microgaming have gifted this unique and exciting online slots the UK to the slot lovers. In this land-based slot, there is a diamond twist. The fruits symbols of this slot are layered with diamonds along with the other symbols too. Just for the Win(JFTW) is a gaming development software company who are dedicated to developing entertaining and fun concepts in video slots. The management of JFTW wants to assure the slot players all over the world that they will keep on developing online slots with unique features that will make them love every moment while they play those exciting slots. The company had started its journey back in 2016 and introduced their first slot in May 2017. They are growing the team members in order to gift the gaming industry with more and more exciting slot games. There are a variety of games with diamond themes such as Diamond Deal slot and Diamond Strike online slot. There is not much variance in the bonus feature of this game but it is unique. It does not have online slots free spins that would have been welcomed by the slot lovers. Anyways the re-spin feature is quite exciting and is loved by players all over. The Deco Diamond Re-Spins feature is activated when 2, 3 or 4 Deco Diamonds appears on the reels. You will be awarded one free respin, while this round is on anyone reel that has Deco diamond symbol will freeze in its place and the other 4 reels will spin. During this, if another Deco Diamond symbol shows up on the reels then you will get another re-spin. This feature will continue till deco diamond symbol keeps appearing. Once it does not appear you will not get any more re-spins. The next feature is the Bonus wheel feature that is triggered after 3, 4 or 5 Deco Diamond symbol appears on the reels during any Re-spin feature. As mentioned earlier the sticky deco diamond reel will lock in its place and the other reels will spin in order to complete it. The bonus wheel can be played directly afterwards. There are three levels in the bonus wheel. Diamond is achieved after 5 Deco Diamond symbol lands. Each wheel has its multiple prizes that will escalate in size. You can win the maximum prizes that can be up to 1000x your bet in the Diamond level. When the wheel stops you will find a level up a tile that can let you progress to the next level. Playing online slots UK becomes fun when you can play them on any device and this slot by Just for the Win is set to be played on any device, be it mobile, desktop, laptop or tablets. It can be played on any platform as it is designed on HTML5. It will give you the perfect feel and showcase the classic animation on any device that you choose to play Deco Diamonds. MoneyReels.com gives you the opportunity to play this game on any device irrespective of the platform that the device is being operated. Play on Android, Windows, Mac or Linux. The graphics of this game is enticing as it follows the art deco style. Even the reels are curved that gives the players a different feel of original slot machines while they play. The soundtrack that follows is an ideal mate to the theme making it more interesting for the players while they wait for the reels to stop spinning and waiting for a big win. Everything in this slot is about its décor, the shiny symbols, and their clear cut designs and of course the impression that this slot creates. The deco Diamond is the wild symbol that can substitute all others symbols in this game. It is also the highest value symbol and it will give you 10x, 50 x or 1000x your bet when you get a combination of 3, 4 or 5 of it on any active payline. This game has Autoplay option which means you can let the spins automatically without spinning them manually. It will save you from any repetitive process. The RTP of the game is high with 96.03% and for a lucky one, the final winning amount can be 2323 times of their stake. Will it be you? Deco Diamonds do not have too many reels to let you bet more but in its 9 paylines, you can wager from 10p to £50 per spin. It has 5 reels that are full with beautiful symbols that gives you the winning combos. The different symbols in this money slots include lemons, cherries, peaches, bells, watermelons, 7s and of course diamond. Here the high-value symbols are the gem-studded sevens, bells and the diamonds. The fruit symbols are the lower value symbols. 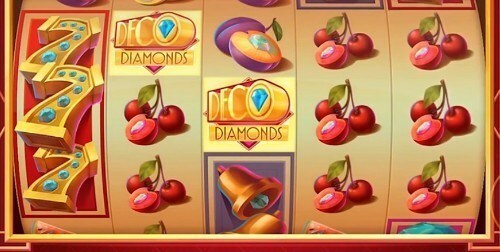 The theme of Deco Diamond is nothing new in the vast industry of online slots. In order to win real money online instantly, you can play other games. Lucky Links is a slot game that is similar to this in style if not in features.